Kevin and Louis have been extremely busy with various work projects. They have been working long hours in order to complete their work, and due to the current workload, not much has happened with the container house project. Therefore we decided to tell you about our favourite frozen yoghurt and waffle house. 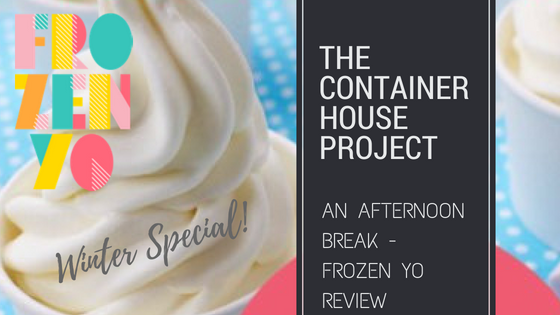 Herewith our FrozenYo Review! After a hard week of work, Kevin and I went for a drive one recent Saturday afternoon and ended up at our favourite waffle house. We discovered FrozenYo a few months ago and have been back a couple of times because we just love the friendly atmosphere and the helpful staff, not to mention the delicious food. The owner, Nicholas, has been on site attending to customers every time we arrived with a waffle craving. If you appreciate fat, fluffy and crispy waffles, this is the place to visit. Their light-as-a-cloud waffles come with a variety of sweet and savoury toppings to suit almost any taste. They also serve excellent coffee. FrozenYo are located on the Blouberg Beachfront in Cape Town and although visiting the beach is more of a summer activity, it is worth visiting them even on a cold winter’s day. The bright colours of the shop are sure to cheer you up, whatever the weather is doing, as you indulge in a hot waffle and coffee. They have a selection of board-games, should you wish to stay for a while. FrozenYo also have a food truck service. If you are looking for something unique for an event, look no further as FrozenYo’s food truck is available for all sorts of events. Their repertoire includes weddings, corporate events, school functions, music festivals, markets, etc. So would you like to see what their food looks like? Sorry, you’re going to have to go and see for yourself! Fat, fluffy, crispy waffles with ice cream… Don’t do this to me when I’m sitting in the office and lunchtime is still hours away! Actually, no – torment us a little further. What toppings did you have? Reading your comment is making me want waffles and ice-cream too! I had an eggs Benedict waffle with bacon and a generous dollop of hollandaise sauce and basil leaves. Yum.